Among the top most Naat Khawans that Pakistan has ever produced, the name of Al Haaj Khurshid (Khursheed) Ahmad occupies an eminent space. Khurshid Ahmad was born on January 01, 1956 in Rahim Yar Khan. Khursheed Ahmad Started reciting naats in 1973. The Naat “Koi saleeqa hai arzoo ka, na bandagi mere bandagi hai” was liked very much not only in Pakistan but all over the world as well. After reciting this Naat, Allah gave him so much respect and people started loving me. Then the process went on and Khurshid Ahmad recited Naats not only in Pakistan but also almost in every country wherever Muslims live. 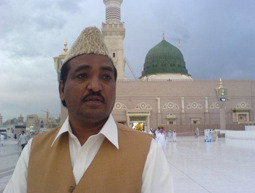 Khurshid Ahmad was a renowned and was a famous Naat Khawan from Pakistan and a well known sweet voice Naat khuwan. He started to recite Naat Khawani and popular very early. when he was only few years old. The melody of his voice and the unique way of reciting attracted numerous people towards him and soon he become a famous Naat Khawan in World.He was a really nice person. Khurshid Ahmed died in 2007. He was admitted to a hospital a week earlier after suffering brain hemorrhage where he was died afternoon after spending two days in coma. Naats download keun nhe ho rahen kuch days sy?????? molvi sahib i would like to say you that words about Glory of Mohammad SAW is not correct that you used. my humbly request that delete this naat becoz molvi says habibe khuda ya khuda kahty kahty . i did not want to heart anyone but words of naat is not correctly describe.